Height: 14 in. Width: 24 in. Depth: 20 in. 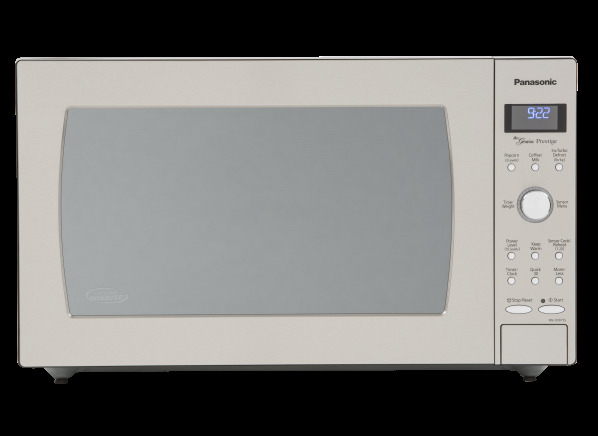 The Panasonic NN-SD975S is part of the Microwave oven test program at Consumer Reports. In our lab tests, Microwave oven models like the NN-SD975S are rated on multiple criteria, such as those listed below. Heating evenness: This reflects how evenly a model reheated a dish of cold mashed potatoes. Results in the following chart are gathered from Consumer Reports’ 2018 Spring Survey of 29,038 countertop microwaves, owned by members who purchased a new unit between 2008 and 2018. Our predicted reliability ratings are based on a statistical model that estimates problem rates within the first 5 years of ownership, for microwaves that are not covered by an extended warranty or service contract. We also adjust for the number of days of use per week. The median in our survey was 7 days per week. Higher ratings are indicative of better reliability. Brands receiving a red or orange rating cannot be recommended by CR at this time. Our owner satisfaction ratings are based on the proportion of members who are extremely likely to recommend their microwave to friends and family. Convection mode Convection mode A few microwaves include a convection oven feature, which has a heating element and a fan that distributes heat. In convection mode, you can set the oven temperature as you would in a traditional oven to bake or roast items. Sensor Sensor Controls the cooking and reheating time automatically. It shuts off an oven when it determines (usually by sensing steam) that food is hot enough. Stainless/SS-look option Stainless/SS-look option Stainless-steel is stylish, but it shows fingerprints. Another option: a vinyl-covered metal finish that gives you a stainless-steel look but resists smudging. Speed-cook mode Speed-cook mode Uses microwave energy in addition to other heating (convection, or supplemental halogen or quartz bulbs) so as to "speed cook" foods normally cooked in an oven or skillet. Grill Grill Allows the oven to grill foods such as toasted cheese sandwiches (cook without microwaves), or to top-brown dishes while cooking with microwaves. Racks for bi-level cooking Racks for bi-level cooking Allows more than one item to be cooked or reheated at the same time by stacking them vertically. This may also be used to improve convection cooking by allowing heat beneath the cooking dish. Watts Watts This is the manufacturer's figure of the microwave power output. In general, the more watts an oven offers, the greater its cooking power-and the faster your food will be cooked. That said, differences in claimed wattage of 100 watts or less are unlikely to result in significant differences in performance. Detailed prompts Detailed prompts Display offers instructions to guide you through the cooking process. Type Type Countertop models are listed in size categories according to the manufacturer's claimed interior volume. Compact models are 0.5 to 0.9 cubic feet, mid-sized models are 1.0 to 1.2 cubic feet, and large models are 1.3 to 2.2 cubic feet. Over-the-range models mount directly over a standard 30-inch range and act both as a microwave and as an exhaust fan. Door-Open Method Door-Open Method The doors on most ovens open with a button press, but some have a handle. Neither method is better; it's a matter of personal preference. Touchpad/Dial Touchpad/Dial On most ovens, cooking times are entered on a numeric keypad. On some models cooking times and/or programs are selected by turning a dial. Neither method is better; it's a matter of personal preference. Power level display/recall Power level display/recall Some ovens automatically display the power level you've chosen. Most others will show that level momentarily, on command. Turntable diameter (in.) Turntable diameter The measured diameter of the oven's turntable, rounded to the nearest tenth of an inch, not including rim. Rectangular tables -- which typically move from side to side and can generally accommodate larger dishes -- are also measured to the nearest tenth of an inch. Their dimensions are given as length by width. Note that similar and non-tested model specifications are provided by the manufacturer when available, and are not confirmed by Consumer Reports. Exterior height (in.) Exterior height Our measurement, rounded up to the nearest inch. Exterior width (in.) Exterior width Our measurement, rounded up to the nearest inch. Exterior depth (in.) Exterior depth Our measurement, including the handle and all protrusions in the back, rounded up to the nearest inch.